Last week we looked at a different side of Jesus than we usually consider. There were times when He was blunt and outright offensive to the religious sensibilities of the people in His day. Jesus’ bold teachings still confront us today, and it’s actually good for us that they do. Here’s the question we considered at the end of last week’s blog: What was Jesus’ purpose in coming to this earth, and how do His blunt, offensive teachings serve that purpose? Jesus expressed His purpose in John 3:16, 17—probably the most loved and well-known of all Bible passages: “For God so loved the world that he gave his one and only Son, that whoever believes in him shall not perish but have eternal life. For God did not send his Son into the world to condemn the world, but to save the world through him.” He did this by giving “his life as a ransom for many” (Matt. 20:28). 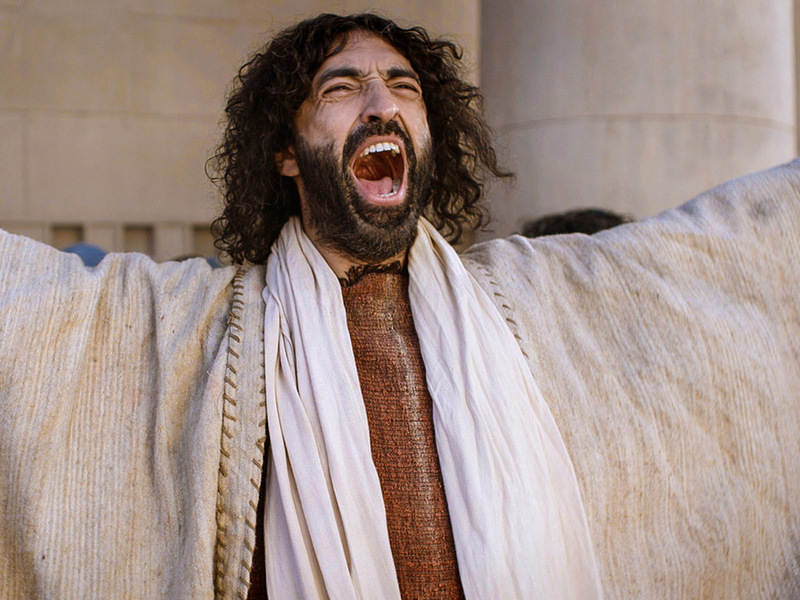 He also said, “I have not come to call the righteous, but sinners to repentance” (Luke 5:32). Jesus came to this earth to save sinners by sacrificing His life for them and calling them to repent of their sinful ways and to believe in Him as Savior and Lord. So how do Jesus’ offensive teachings serve that purpose? First, consider what Jesus’ death tells us about God: He will go to any lengths to save us. He will sacrifice His very life to redeem us. Such a God will not let anything stand in the way of His rescue mission, not even the self-righteousness and pride of self-proclaimed “good” religious people. Jesus loved the Pharisees. He wanted to save even them! If we read His blunt conversations with them and think that He’s simply giving them a slap on the wrist for their holier-than-thou attitudes, we would miss the point. This is the same Jesus who wept over the city of Jerusalem, knowing that their rejection of Him would lead to a terrible end (see Luke 19:41-44). This is the Jesus who, even after pronouncing woe upon woe against the Pharisees, cried out, “O Jerusalem, Jerusalem, you who kill the prophets and stone those sent to you, how often I have longed to gather your children together, as a hen gathers her chicks under her wings, but you were not willing” (Matt. 23:37). The heart of God breaks for lost sinners and yearns to save them, even those who reject Him and refuse the grace He extends to them. If He needs to bluntly offend us in order to get through to us, He will. Jesus will not let anyone slip easily into hell. He will meet our false sense of self-righteous security with a truthful smack upside the head. Apart from violating our free will and His own loving character, Jesus will do anything to wake us out of our sinful stupor. “Woe to you, teachers of the law and Pharisees, you hypocrites! You shut the kingdom of heaven in men’s faces. You yourselves do not enter, nor will you let those enter who are trying to. Woe to you, teachers of the law and Pharisees, you hypocrites! You travel over land and sea to win a single convert, and when he becomes one, you make him twice as much a son of hell as you are.” (Matt. 23:13, 15). Both of these reasons—Jesus’ desire to save even the stubbornly self-righteous, and the tendency of the self-righteous to inhibit the salvation of others—are still applicable today. The attitude of the Pharisees is alive and well, sometimes within our own hearts. Those of us who have been religious for much or all of our lives are especially susceptible to Pharisaical pride. And like the Pharisees, we do not see ourselves as prideful, but rather as good, moral, religious folks. In next week’s blog we’ll look at some practical implications of Jesus’ offensive teachings. We’ll end this week’s blog with another question: If Jesus was gentle and compassionate with wayward sinners, but blunt and offensive with the respected religious leaders of His day, how might He relate to 21st century well-churched Christians? What would He say to us? When I first started this blog, the big project I undertook was a study on the Bible’s teachings about wealth. I wrote a couple entries in that series and had plans for many more. Then we had a baby, and my life changed drastically—in a good way, but still, it is quite an adjustment. I still intend to write more in the theology of wealth series, but it is a time-consuming project and lately I have not had the time to work on it. I’m a strongly melancholic personality, which means I tend to be a perfectionist; if I’m going to do something I’m going to do it well or not at all. So for those of you who were interested in following that series, just keep an eye on my blog. Hopefully in the next few weeks I’ll get back to it. In the meantime, I will still be blogging shorter weekly posts on a variety of topics. I pray that this blog will continue to “stir up your pure minds” for deep reflection on important issues that we all face while living in this atmosphere. Suffer me to come to Thee. So goes the first verse of the old hymn. It reminds us of the little children who Jesus welcomed with open arms (Luke 18:16). The Gospels are filled with stories of Jesus’ kindness and gentleness. Jesus showed the woman caught in adultery forgiveness instead of condemnation (John 8). He treated the Samaritan woman at the well with dignity, even though He knew about her sordid personal life (John 4). When He saw the multitudes He had compassion on them because He realized “they were harassed and helpless, like sheep without a shepherd” (Matt. 9:36). But there are also stories that reveal a different aspect of His character. While interacting with faltering, failing sinners He was tender and compassionate. But when dealing with the religious leaders of His day, the “good” people, the “moral” people, He could be quite blunt. In fact, if we really took His words to heart we would probably find them offensive, as did the religious, “churchy” people of His day. 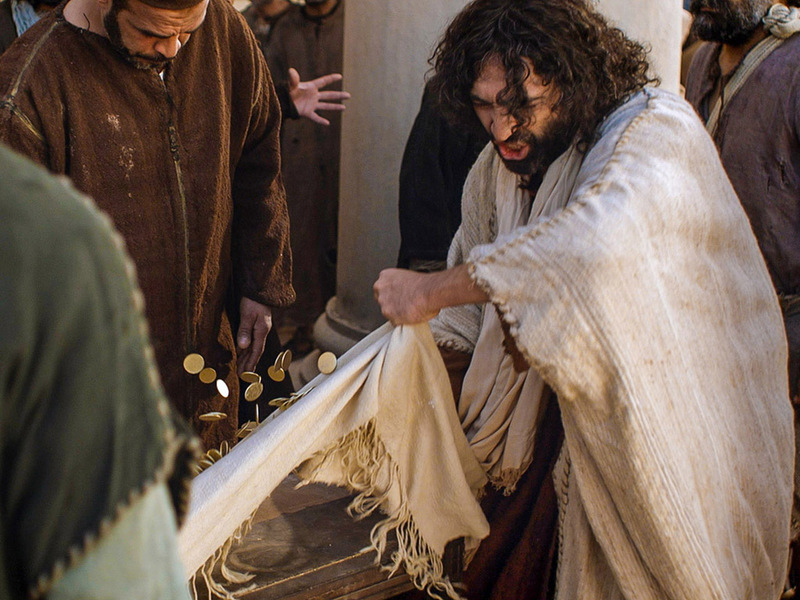 Gentle Jesus, meek and mild, could also be righteously angry Jesus, upending the tables of the moneychangers and driving those shameless swindlers out of the temple with a whip (John 2). He could also be sharply rebuking Jesus, who called the religious leaders of His day hypocrites, whitewashed tombs, blind guides, snakes, and sons of hell (Matt. 23). To deepen the impact of some of Jesus’ offensive statements, let’s bring them into the 21st century. Imagine that Jesus walked into your church one day and declared, “The homosexuals and the Muslims are getting into heaven ahead of you Christians” (see Matt. 21:28-32). Or imagine that He told a story about two men who came to prayer meeting one night: one a good, upstanding church elder and the other a divorced, jobless, hopeless alcoholic (see Luke 18:9-14). The twist in His story is that the alcoholic, rather than the church elder, went home forgiven and accepted by God. How would you respond? How do you think most Christians would respond? I live in the Bible Belt, not far from Chattanooga, which was recently named the most Bible-minded city in America. I can tell you how most people here would take it: not well. But that’s very similar to how offensive Jesus’ actual words were when He told the Pharisees that the worst sinners of all, the tax collectors and the prostitutes, were entering the kingdom of God ahead of them, and were justified by God instead of them. It’s no wonder why they plotted to kill Him. He called them out publicly and deeply offended their religious sensibilities—and their pride. “Instead, speaking the truth in love, we will grow to become in every respect the mature body of him who is the head, that is, Christ” (Eph. 4:15). What does it mean to speak the truth in love? How do we confront people with the convicting testimony of God’s Word while remaining compassionate and caring? Is it a matter of somehow balancing truth and love (as if they’re competing concepts)? Is it a matter of presenting truth in the most loving way possible? Are there times we hold back the truth in order to be loving? Some will insist that the most loving thing to do is to tell the “straight testimony” without pulling any punches. If people have a desire to know and follow the truth, then it won’t matter if our presentation is a little rough around the edges. We shouldn’t be concerned with pleasing the masses. Truth confronts and convicts, so just let ‘em have it, and let the chips fall where they may. 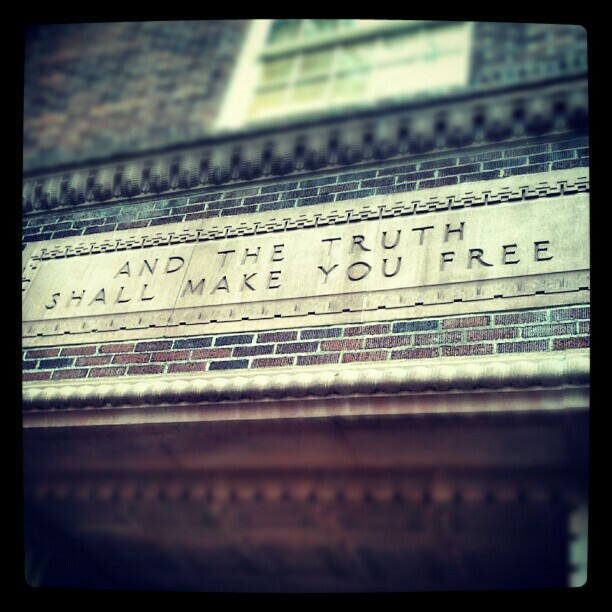 Truth does indeed confront and convict; there’s no doubt about that. But there’s a question that has been nagging in my mind for a little while now. It comes from putting together a couple of fundamental biblical principles. The first is found in John 14:6: “Jesus answered, ‘I am the way and the truth and the life. No one comes to the Father except through me.’” Truth is actually a Person—Jesus Christ—and not merely a set of facts. So if I really want to tell people the truth, I have to introduce them to Jesus. The second biblical principle comes from 1 John 4:8: “Whoever does not love does not know God, because God is love.” Not only is Jesus the truth, He is also love. So here’s the question: If I speak the truth, but not in love, is it still the truth? In other words, if my presentation of the truth fails to convey the love of Jesus, then I’ve left out a fundamental aspect of God’s character. And if I’ve misrepresented God’s character, then have I really communicated the truth, since Jesus, and not mere facts, is the truth? Now, the “straight testimony” folks would probably argue that we could take this love thing to an extreme and never really confront sin because we’re too busy trying not to offend. They have a point—but only because we humans have a hard time understanding what love really means. Loving someone does not mean enabling them to continue doing what’s wrong. We don’t need to counterbalance love with truth, or vice versa; rather, we need a right understanding of God’s love. So the question remains. My belief right now is that if I merely present a set of facts but I don’t demonstrate the love of Jesus, then I haven’t actually spoken the truth at all. I’ve only misrepresented the truth, because I’ve reduced it to mere propositions. Those things don’t cease to be true if I don’t speak them in love. But I haven’t actually spoken the whole truth if I don’t speak it in love. Believing in facts will not save us; believing in Jesus will. I challenge you to consider how you speak the truth to others. Are you presenting truth the Person, or truth the proposition? Look at the last part of Ephesians 4:15, the verse I quoted in the beginning. It says that the goal of speaking the truth in love is for all of us together to mature into the body of Christ. We will become like Jesus! Let’s imitate His example. That’s the best way to ensure that we’re always speaking the truth in love. I’ve Joined The Hub Project! I’ve just joined a network of balanced, Christ-centered blogs called The Hub Project. From now on I’ll be posting blogs on a weekly basis (the goal is to blog at the beginning of the week, but I’m still working on this week’s blog). I’ve also added a page of links to all of the other blogs in the network. Check them out and enjoy the rich variety of content that this network provides. And stay tuned to my blog for more frequent posts. I started this blog with the high intentions of making it a weekly blog. That was probably too lofty of a goal since I started just months before becoming a father for the first time. Now that I’m settling into my new routine I’m getting back on track with a lot of things, including this blog. I pray it blesses you on your journey in this atmosphere.